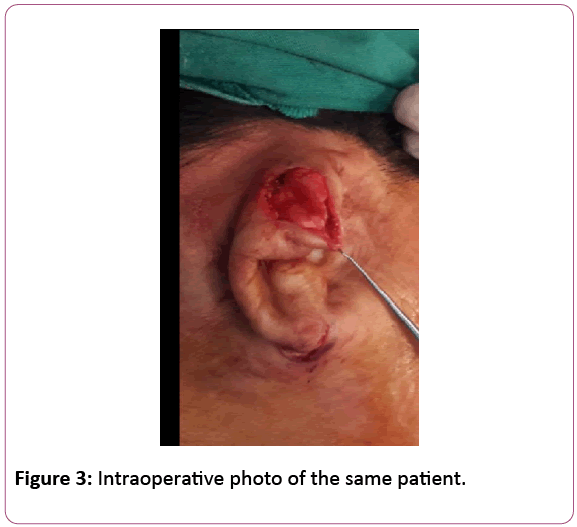 Citation: Rajbhandari S (2018) Repair of Constricted Ear. 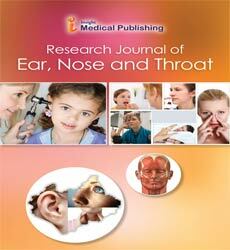 Research J Ear Nose Throat. Vol.2 No.1: 5. Copyright: © 2018 Rajbhandari S. This is an open-access article distributed under the terms of the Creative Commons Attribution License, which permits unrestricted use, distribution and reproduction in any medium, provided the original author and source are credited. The external ear comprises of the pinna (auricle) and the external auditory canal. The form and shaping of the fibroelastic auricular cartilage, covered by skin with fine pores determines the contour of the ear [1,2]. The lobule is devoid of cartilage, and is composed of adipose and connective tissue. The anatomic elements of the ear are the root of helix, helix, antihelix, inferior/ anterior crus of antihelix, superior/ posterior crus of antihelix, tragus, antitragus, triangular fossa, scaphoid fossa, concha cymba, concha cavum and lobule (Figure 1). The auricle develops from hillocks of the second branchial arch with the formation of lobule, the antihelix and the dorsocaudal portion of the helix. The cartilage of the tragus is formed from the first branchial arch . 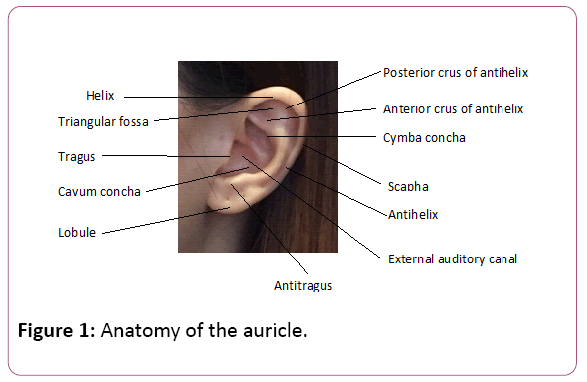 Figure 1: Anatomy of the auricle. Constricted ear combines the elements of overhanging upper pole (lop) with the degree of protrusion (cup). There are four main components to this abnormality . The helical rim becomes flattened and overhangs due to absent or reduced superior crus, fossa triangularis and scapha. This is also known as “lidding”. This may be accompanied by varying degrees of microtia. Flattened antihelix and helical rim causes deepening of the conchal fossa which results in protrusion. In the mild form, the helix alone may be folded. In the more severe form, the cartilage of the helix and scapha may be constricted and they form a tight roll. In 1974, Tanzer classified constricted ears in three groups and two subgroups (Table 1) . When both the helix and the scapha are involved (as in our case), Tanzer differs between group IIa and IIb. Techniques which aim to elongate the upper pole are used; such as V-Y or Z advancement of root of helix, D - flap, Banner flaps, etc. In our patient, both the helix and the scapha were involved, causing collapse of the upper part (superior crus of helix) of her auricle. This caused a lidding appearance of her ear. According to our findings, we placed her in the Tanzer IIa type classification. IIb in loss of vertical height, lidding, and protrusion IIb: no antihelical crura, considerable height reduction. Supplemental skin necessary to expand the auricular margin. Table 1: Tanzer classification of constricted ears. The helical base was marked for a V-Y incision. 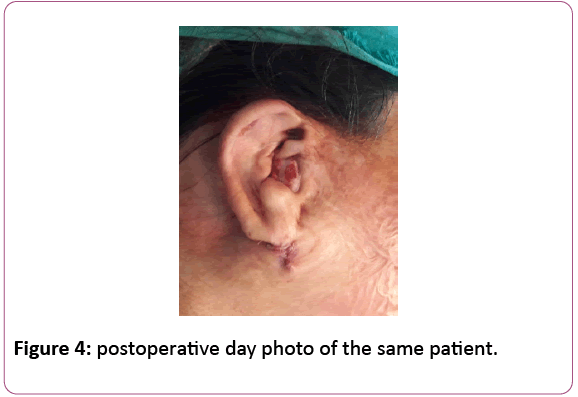 The superior incision of the V-Y was marked along the posterior auricular line, 1.5 cm proximal to the periphery, and carried out through posterior skin and cartilage. The V-Y released the helix base by lengthening the circumference. The ear was then folded into the desired shape to attain the antihelical folds and the helical height. The newly created areas of convexity were marked onto the anterior skin. The abnormal cartilage concavities were lightly scored using parallel incisions to create normal convexities to raise the helix rim and form the antihelical folds. The superior oblique fold extending from the main antihelix fold upward and forward (the superior crus of the antihelix), corrected the lidding of the helix. Then, the scored cartilage was fixed using mattress sutures of 4.0 prolene (Mustarde technique). A small amount of post auricular skin was trimmed and the posterior incision was closed using 4.0 catgut. External compress dressing was applied over the ear for 5 days. The patient was asked to keep the external compress over her ear for 5 days to avoid hematoma. She was advised to not lie over her operated ear and keep the wound dry Figures 2-4. Figure 2: Preoperative photograph of 20/F. Figure 3: Intraoperative photo of the same patient. Figure 4: postoperative day photo of the same patient. In a unilateral constricted ear, different techniques may be used to achieve bilateral auricular symmetry. Combination of procedures such a V-Y advancement of the helical root, conchal cartilage grafting, mastoid hitch procedures, etc, may be used for correction . Our patient, who belonged to Tanzer type IIa, only required a V-Y advancement flap, cartilage concavity scoring and fixing using the Mustarde technique. The V-Y incision/ advancement technique is sufficient to turn the ear back into a normal position by forming the main antihelical fold. This is sufficient for a Tanzer IIa constricted ear and does not require any additional cartilage grafting. Tanzer RC (1975) The constricted (cup and lop) ear. Plast Reconstr Surg 55: 406-415. Siegert R, Weerda H, Remmert S (1994) Embryology and surgical anatomy of the auricle. Facial Plast Sur 10: 232-43. Cosman B (1978) The constricted ear. Clin Plast Surg 5: 389-400.